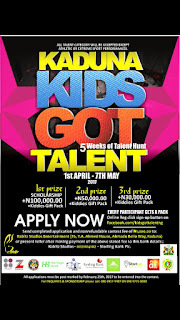 The Kaduna Kids Got Talent is now slated for 1st April - 6th May 2017. Enroll your kids - Discover their Talents... Promote peace and Community prosperity! Note: All talents categories will be accepted except athletic or extreme sports performances.